Fame at last. 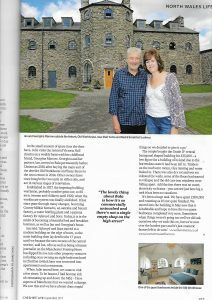 The old workhouse b&b is featured in the September issue of Cheshire Life – and we haven’t even opened yet! So if you chance upon a copy and are wondering whose ugly mugs are staring out of the page at you in front of our lovely old workhouse, it’s not a pair of gargoyles – it’s George and me.